Caledonian Decoy: Exhibition overview, 2017 from Collins & Goto Studio on Vimeo. Tim Collins and Reiko Goto’s dense and thought-provoking exhibition brings together a number of recent works developed as part of what they describe in the accompanying catalogue as ‘A Critical Forest Art Practice’. * This body of works, made ‘with rather than in’ forests in Scotland is intended to ‘explore […] new relationships between humanity and nature’. Key to Collins and Goto’s approach, and at the core of the exhibition, is the concept of the ‘cultural decoy’, a term which they use to describe several of the works. 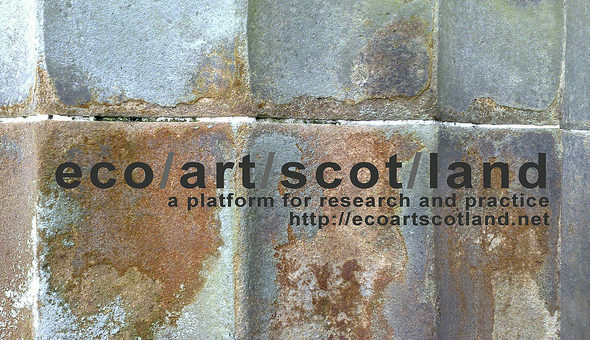 As I understand this provocative and generative concept, a cultural decoy is an artefact that is intended to lure the audience/spectator into a relationship with the entanglement of nature and culture that comprises what is commonly referred to as ‘the environment’, and in the particular case of this exhibition, with the natural-cultural environments of Scotland’s forests. The word ‘decoy’, particularly employed in this context, is loaded and complex. It has clear associations with hunting, leading me to reflect on the implications of identifying art objects as decoys in this gallery-based, ecologically inflected exhibition. A decoy may be set by the hunter to trap prey, but also deployed by those pursued to distract or mislead the hunter. A further frame which seems pertinent to Goto and Collins’ exhibition, though not one overtly referenced by the artists, is Robert Smithson’s notion of site/non-site. Smithson’s grappling with the productive paradoxes of exhibiting work with site-responsive origins in a gallery distant from the originary location has, for me, useful resonances. Goto and Collins appear to share Smithson’s approach, complexifying the relationship between the ‘cultural’ space of the gallery and the ‘natural’ forest environments from which their work emanates. The exhibition includes six photographic and sculptural works that Collins and Goto consider to be cultural decoys and a video work titled Decoy, installed in the tight confines of the Intermedia Gallery at the Centre for Contemporary Art, Glasgow. The central and most imposing of the cultural decoys, Fiadh, is a group of cage-like structures constructed from metal fencing and wooden posts, which stand at approximately human head height. The cages, if viewed from above, spell out the word fiadh which, exhibition notes tell me, is ‘Scottish Gaelic for deer, but also references wildness’. One of the cages contains cowberry, bilberry, heather and bracken growths. The work is intended as a maquette for a much larger scale sculpture, which the artists intend to function as a deer fence, protecting recently harvested forest plantation from deer herds. The full-scale work would evolve over time, as the metal fencing is engulfed by maturing trees. It’s a work that invites me to contemplate the inextricable intertwining of nature and culture in Scotland’s forests (and wider ecology) and to consider multiple, opposing and overlapping, perspectives on land stewardship and re-wilding. For me, it functions effectively as a cultural decoy — a gallery-based proposition, luring the spectator into a conceptual engagement with the natural-cultural entanglements of Scotland’s forests. It doesn’t reference or evoke a specific forest location, but functions as a speculative work that points towards conditions common to Scotland’s woodlands and brought about through competing demands of deer preservation and timber cultivation. 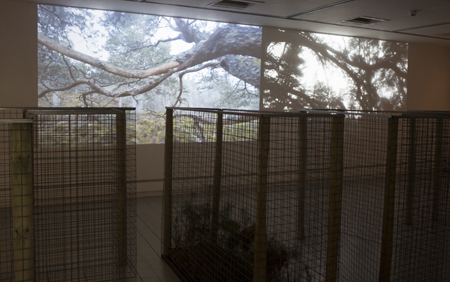 Decoy, a split-screen projection showing video footage of movement advancing into and retreating from a dense, ancient forest environment (the forward movement in colour and the retreat in black and white) fills another gallery wall. The footage has the shaky appearance and point-of-view of hand-held camera work. I watch the video while standing among the fence structures of Fiadh. Other visitors stand in front of the wire mesh, in close proximity to the projection/gallery wall. I note my sense of enclosure and my fragmented view of the video, which to me mimics the physical and visual experience of being in a dense woodland. I contemplate the gallery as natural-cultural space, a forest-within-gallery, or gallery-within-forest. The camera movement and my position within the fencing structures evokes for me the somatic experience of moving through a forest environment. Decoy’s sound-track (a commentary reflecting on the Caledonian forests of Scotland and key terms used by the artists, followed by field recordings of rutting deer) and the more formal aspects of the editing (spilt screen projection in colour and monochrome), however, pull me back from this more affective, sensory interaction with the work. You can see Decoy here. I experience a similar withdrawal from the somatic and immersive dimensions of the five wall-based pieces, also described as cultural decoys. Lanolin, Can You See the Forest of Scotland? is a sheep’s fleece, manipulated to pick out a saltire in washed white wool against a greyer background of untreated fleece. The Ladder in the Wood is a photograph of a deerstalker’s ladder, once used to access a treetop platform from which the stalker could observe and shoot deer. The ladder is rotting and becoming indistinguishable from the fabric of the tree against which it stands, no longer fulfilling its human-determined function. Fearna/Co2 is a piece of Alder tree bark into which a carbon dioxide monitor, linked to a noise generator, has been inserted. As human spectators approach, the noise level increases in response to their Co2 exhalations. One of two linked pieces, Taod Gaoisdei, is a bit-less horse bridle, woven from twisted birch twigs and horse hair. Exhibition notes inform me that in Scottish folklore a birch bridle could be used to harness a kelpie, the mythical Scottish horse-sprite. 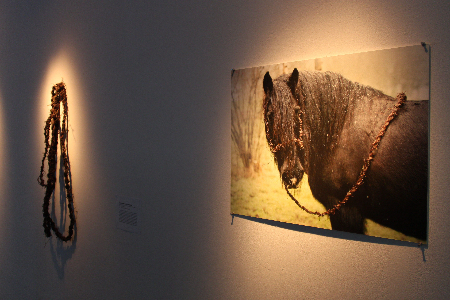 A photograph of Goto’s other-than-human collaborator, native-breed horse An Dorchadas, wearing the bridle, accompanies the sculptural piece. These five works operate, for me, as cultural decoys at a conceptual level, pointing to complex entanglements of the natural and the cultivated, human and other-than-human. However, compacted into Intermedia’s small exhibition space, and with prominent explanatory text, my interaction with the wall works feels slightly skewed towards the ocular and intellectual. I feel constrained, for instance, from taking up the invitation to interact with the carbon monoxide monitor in Fearna/Co2, or from touching the fleece in Lanolin, Can You See the Forest of Scotland? FEÀRNA / CO2, 2017 from Collins & Goto Studio on Vimeo. While I may have welcomed a little more space (both physical and interpretive) for open-ended, sensory and affective interactions with the works, A Caledonian Decoy is a rich and thoughtful exhibition that makes a sophisticated and valuable contribution to debates about the natural and the cultural, art and the environment. Goto and Collins’ decoys remain ambivalent — are they set by hunter or prey, poacher or gamekeeper? — suggesting the impossibility of untangling the competing and shared impulses and intentions that play out in the natural-cultural environments of Scotland’s forests. All photographs and videos courtesy of the artists. Minty Donald is an artist and senior lecturer in contemporary performance practices at the University of Glasgow. She is interested in the idea of more-than-human performance, where performing is understood as not just a human activity. Minty works regularly with (human) collaborator Nick Millar. Recent work includes THEN/NOW, a public art project with/for the Forth and Clyde Canal and Guddling About, an ongoing project with rivers and other watercourses, which has been performed in Canada, Spain, Germany, Australia and the UK.